PITTSBURGH, Pa.–Carmel Majidi and Jonathan Malen of Carnegie Mellon University have developed a thermally conductive rubber material that is reported to represent a breakthrough for creating soft, stretchable machines and electronics. The findings were published in Proceedings of the National Academy of Sciences, Carnegie Mellon said in a press release. The new material, nicknamed "thubber," is an electrically insulating composite that is said to exhibit an unprecedented combination of metal-like thermal conductivity and elasticity that is similar to soft, biological tissue, and can stretch over six times its initial length. 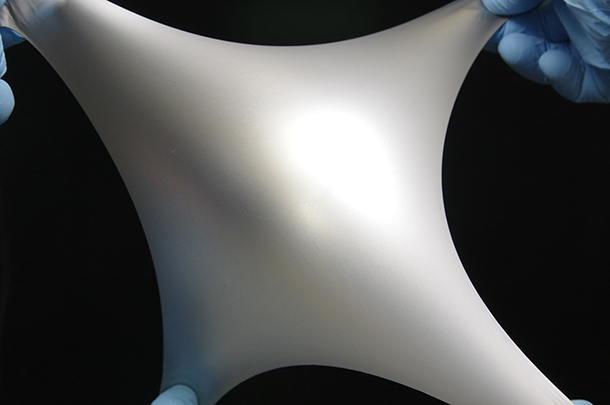 "Our combination of high thermal conductivity and elasticity is especially critical for rapid heat dissipation in applications such as wearable computing and soft robotics, which require mechanical compliance and stretchable functionality," said Majidi, an associate professor of mechanical engineering. Applications could extend to industries like athletic wear and sports medicine–think of lighted clothing for runners and heated garments for injury therapy. Advanced manufacturing, energy, and transportation are other areas where stretchable electronic material could have an impact. "Until now, high power devices have had to be affixed to rigid, inflexible mounts that were the only technology able to dissipate heat efficiently," said Malen, an associate professor of mechanical engineering. "Now, we can create stretchable mounts for LED lights or computer processors that enable high performance without overheating in applications that demand flexibility, such as light up fabrics and iPads that fold into your wallet." The key ingredient in "thubber" is a suspension of non-toxic, liquid metal microdroplets. The liquid state allows the metal to deform with the surrounding rubber at room temperature. When the rubber is pre-stretched, the droplets form elongated pathways that are efficient for heat travel. Despite the amount of metal, the material is also electrically insulating. To demonstrate these findings, the team mounted an LED light onto a strip of the material to create a safety lamp worn around a jogger's leg. The "thubber" dissipated the heat from the LED, which would have otherwise burned the jogger. The researchers also created a soft robotic fish that swims with a "thubber" tail, without using conventional motors or gears. "As the field of flexible electronics grows, there will be a greater need for materials like ours," said Majidi. "We can also see it used for artificial muscles that power bio-inspired robots." Majidi and Malen acknowledge the efforts of lead authors Michael Bartlett, Navid Kazem, and Matthew Powell-Palm in performing this multidisciplinary work. They also acknowledge funding from the Air Force, NASA, and the Army Research Office. For more on stretchable electronic materials, see You Might Forget You're Wearing These Electronics and Is a Stretchable Smart Tablet in Our Future?.